Mail Merge is getting an update! It’s called Campaigns and it’s smarter than ever. Check out our Getting Started guides to learn more about Campaigns. You can save past mail merges as a template using the "Save as a Template" option to the right-side of the mail merge. This will allow you to easily craft a mail merge to a new group of recipient using the same content and schedule you have done in the past. You can also create a mail merge template from scratch by using the blue New Mail Merge Template option under the Mail Merge > Mail Merge Template page. Mail Merge Templates are a Yesware Labs feature. We've recently launched the ability to share mail merge templates. 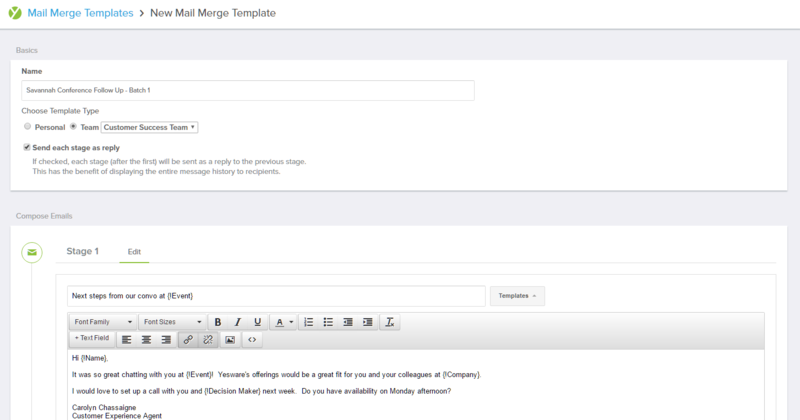 Team Managers can now share mail merge templates across the team and edit team templates. To do so, click the Mail Merge Templates section of the Mail Merge page. From there, locate the Mail Merge Template you'd like to share and choose "Copy" and select the team you'd like to have access to the template. You may also use the "Edit" option to review and update the content. Mail Merge and Mail Merge Templates are available on our Premium and Enterprise plans. Select the "Add to Mail Merge Template" option at the top of the Contact or Lead page in Salesforce. Choose the Mail Merge Template you'd like to use. You can easily add a recipient to a mail merge from within your inbox. To do so, select the mail merge template you'd like to use and click the blue "Add Person" option. From there, you can search Salesforce or manually enter the email, name and any other applicable fields. What are mail merge templates?